No documentation on the available health records related to the type of anaesthesia discussed or consented to during the pre-operative assessments. Postoperatively congestive heart failure was not identified and/or not treated promptly given that Ms. Winckler exhibited signs and symptoms consistent with this condition. Medical management of a patient experiencing critically low oxygen levels and prolonged hypotension. Documentation on the health records at Chilliwack General Hospital. Transfer of an unstable postoperative patient to an understaffed activation ward. No protocol for assessment of patients receiving analgesics and sedation. Providing for the nutritional needs of a patient recovering from surgery. Recognition, documenting and reporting of bowel movements, or lack of bowel movements. Recognition, and reporting of, abnormal signs indicative of a head injury. Overall management of an elderly patient in Chilliwack General Hospital. Recommendations and request for response were sent to the Department of Anaesthesia & PACU at Chilliwack General Hospital; Patient Care Services at Chilliwack General Hospital; Mona Kines, Vice President of Acute and Strategic Services; Dr. Rod Underall, Chief of Medical Staff of the Fraser Valley Health Region; Laurel Brunke, Executive Director of the RNABC; and Dr. T.F. Handley, Registrar of The College of Physicians and Surgeons of BC. 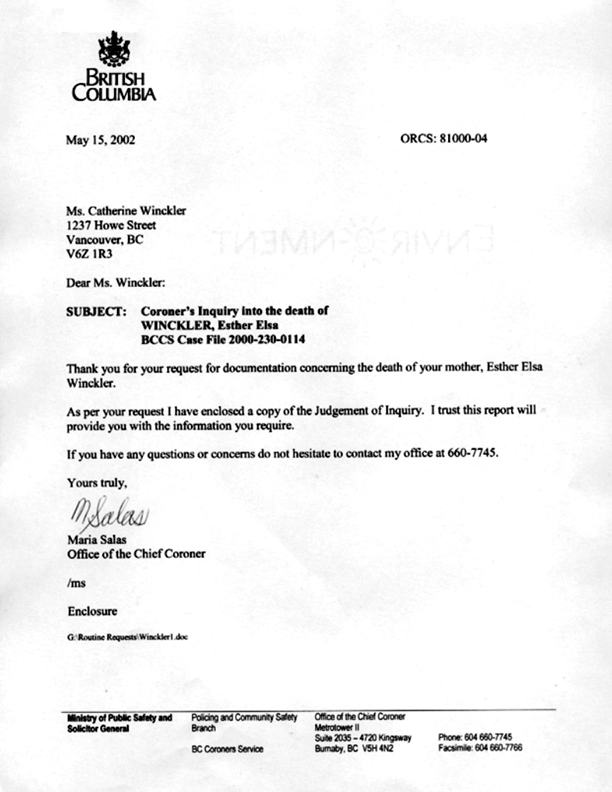 We are hoping that now there is an ‘official’ accounting of what happened February 20th thru March 5th, 2000 someone will let our family know what, if anything, has been changed as a result of Esther Winckler’s untimely death.